You will need to know the volume of oxygen in your container so that you can determine what size of oxygen absorber to use. Oxygen is measured in cubic centimeters (cc). The sizes of our oxygen absorbers correspond to the amount of oxygen they absorb. For example, a 300 cc oxygen absorber will absorb 300 cc of oxygen. What Do Oxygen Absorbers Do? The table below indicates how many cc's of oxygen are contained in the more common sizes of food storage containers. 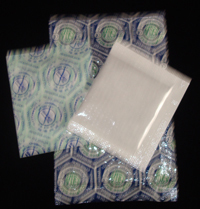 Oxygen absorbers are rated by their capacity to absorb oxygen as measured in cubic centimeters (cc). If a five-gallon bucket were filled with children's marbles, the spaces in between the marbles (void spaces and head space) would represent 38% of the volume of the five-gallon pail ( 0.38 x 18,942 cc = 7,197.96 cc residual air volume ). Of this number, 21.0% is oxygen. a. use this formula if you do not know the volume and your container is a regular shape. b. use this formula if you do not know the volume and your container is an irregular shape. 2. Weigh the food product and convert this weight to grams. (See conversion table below.) To be completely accurate, make sure you subtract the weight of the container to get the net weight of the food. We want to know what size oxygen absorber to use for a 5 gallon bucket of rice. 1. We determine from the table above that there are 18,942 cubic centimeters in a 5 gallon plastic bucket. 3. 18,942 (cc) container volume - 15,876 (g) rice = 3,066 cc residual air volume. © 2006 SorbentSystems.com All Rights Reserved.